I love wild birds in the yard and to attract them I built this platform bird feeder. It stands about six feet tall (so the cats can only drool at the birds instead of eat them). The base is a a 4 x 4 with a square piece of plywood nailed to the top. Dug a hole, poured in cement, popped the post in and voila, a homemade feeder for our feathered friends. Now I hear a symphony of bird calls all through the day. 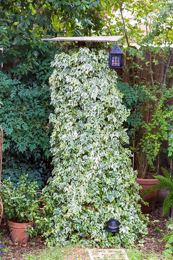 In order to hide the post and to bring a vertical plant element to the yard, I planted variegated ivy and watched it take over. Vertical gardening is a proven gardening technique. It draws the eye up and out outward, can hide unsightly structures, and allow you to fit more plants into your garden. 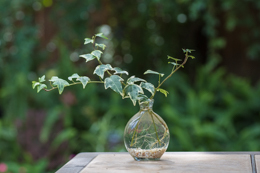 I love this little ivy for its compact leaves and beautiful foliage. And it grows fast which was great as I wanted to cover the post as soon as possible. 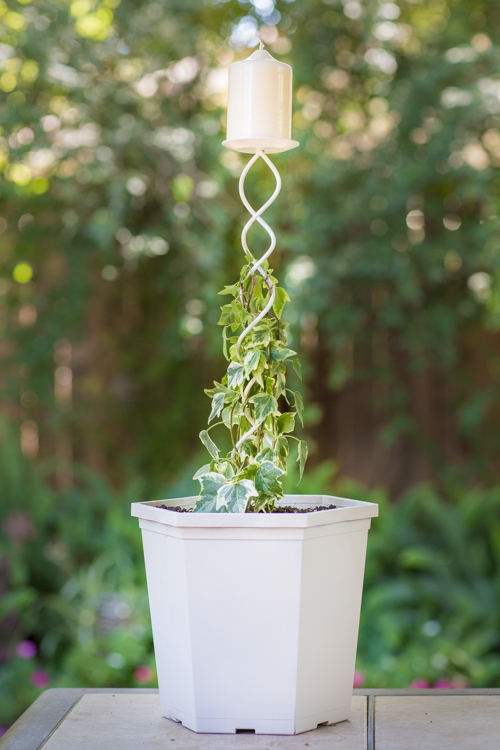 All it took to create this look was two six-packs of ivy and a little training once a month to twine the plants around the post and each other . It’s easy to propagate, too, so I decided to “make” some more. I snipped off some of the vines and stripped off the lower leaves from these “cuttings.” Stripping the leaves helps keep the water healthy because leaves left in the water will rot and cause bacteria to grow. I placed the cuttings in water right away and enjoyed a lovely little piece of my garden in miniature while I waited for the roots to grow. 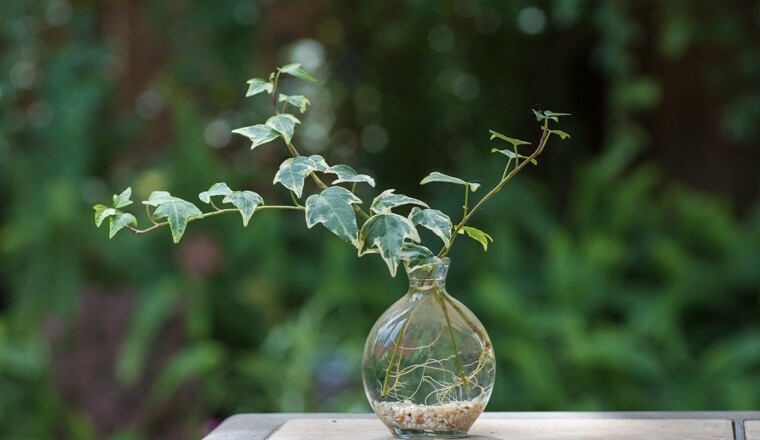 Once my ivy cuttings had rooted nicely, I needed to figure out what I wanted to do with them. My thoughts went to topiary but I didn’t have a structure to build one with so I put that on my thrift store list for the next Saturday shopping trip. 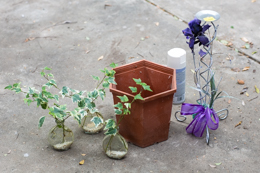 I did have, however, a plastic pot, wire tie-downs, a candle, and some dirt, and would not have to purchase those. Saturday came and I was at the thrift store at 9:00 a.m. I didn’t know what I was looking for exactly or what I would find but that’s more than half the fun. When I saw “beauty” below, I knew it would be perfect. And as an added bonus, it was a candlestick! It was tagged for sale at $1.00 but it was 50%-off on bric-a-brac-day. (I love 50%-off day – as if it wasn’t cheap enough already. An addict I tell you, an addict!) Thus, I had to fork out 50¢ for it — well worth it. I went to the home improvement store next for a can of spray paint. 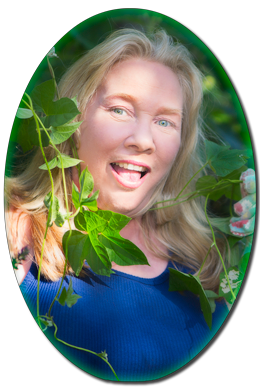 I wanted to keep the color palate of my topiary simple to play up the green in the ivy so I selected an ivory color paint to match the ivory color in the plant. Now I had all my pieces gathered and just need to paint and assemble. First I removed the festive purple, silver, and beaded decoration from the candlestick. And, no, in case you were wondering, I was unable to figure out a way to repurpose that! Next came a quick paint job of both the pot and the candlestick. After filling the pot mostly to the top, I placed the candlestick in the dirt and anchored it down with wire ties. I gently placed the rooted cuttings in the dirt around the base of the stick and trained them up and through the spirals. 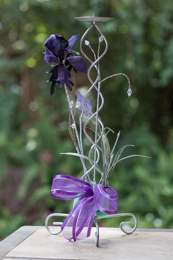 A final topping of soil and a pillar candle finished the job. The paint cost $4.99 and I only used half a can. That with the 50¢ I spent on the candlestick brought me up to about $3.00. What a deal! And, the best part is, no one else has one like it. In a month or so the ivy will be filled in and up and will be a lush topiary for use inside the house or out on the patio and will be enjoyed for a long time to come. And it all started with a little piece of ivy, a bit of imagination, and an eye that can see “out of the box” at the thrift store.